Can't choose? We can help! 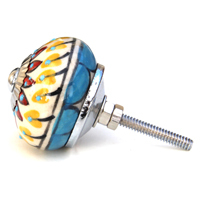 Whether you need 4, 6, 8, 10, 30 or more ceramic knobs we have put together the designs that look great together. Creating a co-ordinating look or a shabby chic eclectic look is easy with our sets of knobs. But we have to confess... the ideas come from you! We are inspired by your great choices and have shared some here. Set of 10 blue beauties.